Is it too cold or to much snow in your home town? Do you love to paint, or you are a beginner who wants to explore the joy of painting, are you a teacher taking a Winter brake or recently retired and looking for a possible place to re locate? Taking a week or two of painting workshops, it's a good excuse to "run away" to Mexico for a little while. 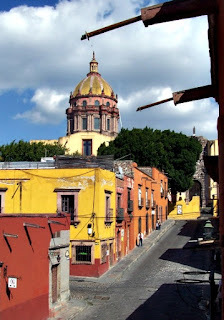 We are located in one of the most beautiful Colonial towns, The Heart of Mexico, as it's sweetly called by Mexicans. The weather is almost perfect, with mild winters and T shirt temperatures at noon. Temperate summers with the most beautiful starry nights. Every season is perfect in it's own right. It is easy to get around even if you do not speak a work of Spanish. The locals are friendly and there are many snowbirds and summer birds. 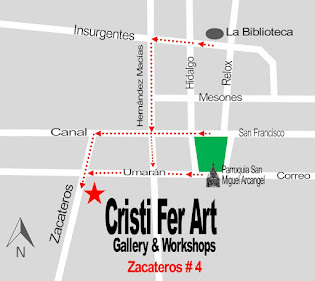 At Cristi Fer Art Gallery and Workshops, we offer painting workshops for all levels, from none to experienced. You can find something for any level or if we do not already offer it, we would love to customize it for you! We provide a drugs, alcohol and smoke free environment. Many who no longer need drugs are feeling isolated since the social convention is to entertain in restaurants. many activities are build around drugs and drinking. We offer you a fun and safe, option! 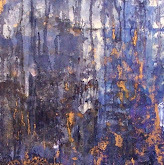 We the painters and the instructors, have many successful years of painting and teaching in US and Mexico. At the top of the page are TABS with workshop options and Instructors art and biographies. Also please take the time to read our great reviews on TripAdvisor. If you are not interested in painting but will be in San Miguel de Allende, take the time to visit our gallery, centrally located. See map on the right.